North Yarmouth native Ben True crosses the finish line to win the 2016 Beach to Beacon 10K Road Race in Cape Elizabeth. True will return to defend his title on Aug. 5. 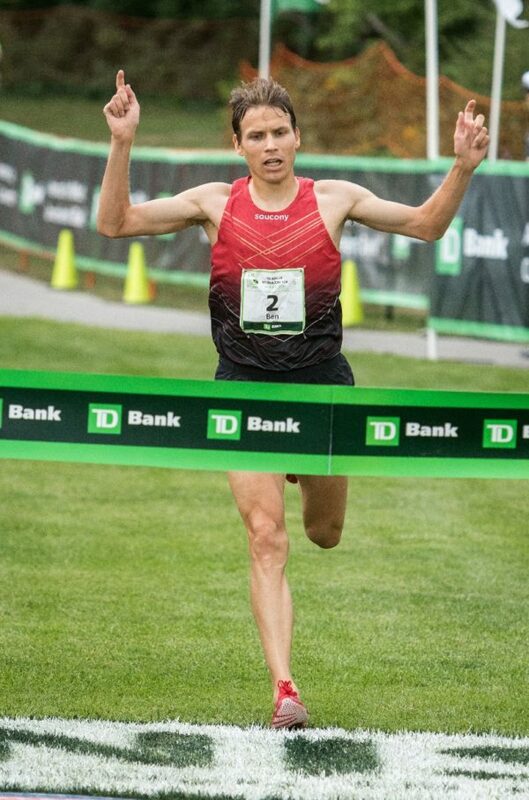 Ben True made history last summer in becoming the first American man to win the TD Bank Beach to Beacon 10K road race. Now, the North Yarmouth native will return to his home soil in search of a repeat in a talented field of professional runners. True will be among 28 professional athletes who will toe the starting line in Cape Elizabeth on Aug. 5 for a 6.2-mile journey to the Portland Head Light, race staff announced on Thursday. The talented field includes Stephen Kosgei Kibet and Stephen Sambu of Kenya on the men’s side and Americans Shalane Flanagan and Jordan Hasay and two-time Olympic gold medalist Meseret Defar of Ethiopia and defending champion Mary Keitany of Kenya on the women’s side. The elite women will start 12 minutes prior to the rest of the field, a change race staff made last summer. Runners are competing for a whopping $90,000 in prize money, with the top male and female finishers pocketing $10,000 apiece. A $23,000 purse for American men and women is also included, to be split among the top five athletes in each division, with the winner taking home $5,000. The 28 elite athletes will join more than 6,500 other runners in Maine’s largest road racing event. In addition to the elite athletes, some of Maine’s best runners will be competing for top Pine Tree State honors. The spotlight will once again be on the 31-year-old True, who now resides and trains in West Lebanon, New Hampshire. His 2016 Beach to Beacon triumph came on the heels of competing in the 5,000-meter final of the U.S. Olympic Trials in Oregon, and earlier this summer, he fell just shy of earning a spot on the U.S. team for the IAAF World Championships in August, coming in fourth in the 5K. The top three runners advanced to the world championships. True has still been stellar on the roads this year, breaking his own American 5K record at the BAA 5K in Boston in April, covering that course in 13 minutes, 20 seconds. True will have challengers in 2015 champ Kibet, who missed last summer’s race due to visa issues, and Sambu, the New York City Half Marathon champ who was second to True at the BAA 5K. Another Maine native, Will Geoghegan of Brunswick, will also run in the professional category. He was the top Maine finisher in 2014. Keitany dominated last summer’s women’s race, breaking the tape nearly a minute ahead of her closest challenger. She clocked an impressive 2:17:01 in winning the London Marathon last spring. Keitany will have stiff competition from Marblehead, Massachusetts native Flanagan, a Beach to Beacon runner-up in 2014 and the American record holder at the 10K distance (30:52). After a back injury kept her out of the Boston Marathon, Flanagan earned a fourth-place finish in the 10K at the U.S. championships, and the Beach to Beacon will mark her first road race since the 2016 Olympic marathon. Other contenders include Hasay, a 25-year-old Oregon native who was third at the Boston Marathon last spring, 2015 B2B champ Wude Ayalew of Ethiopia and 2013 race winner Joyce Khepkirui. Forty-three states, 15 countries and 263 Maine communities will be represented in the field.